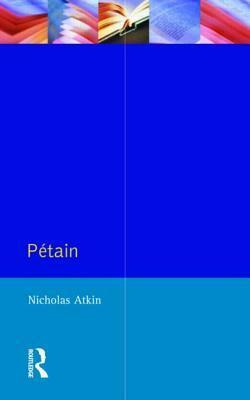 Nicholas Atkin's study of Philippe Petain is an interesting look into a number of challenging situations, many of them still impacting upon our world's thinking and especially the deeper psyche of French Culture. I found this a compelling study in the challenges surrounding leadership along with the impacts of human nature. Petain still revered in France by many for his leadership during both the First World War as well as the Second World War, is equally deemed by many Frenchmen as a traitor due to his involvement in Vichy France during the Nazi occupation. His strengths in excess became his weaknesses, proving once again the trap all men and women in positions of leadership must keep in the forefront of their awareness. Nicholas Atkin has written a superb history of an unusual man in a very demanding and difficult environment. The author's inclusion in focused detail of several other key participants during the Vichy Government- Laval, Admiral Darlin, General DeGaulle and General Weygand makes this study an excellent look inside French History. Atkin's examination of the Vichy treatment of Jews is a revealing look inside the deeper corners of French Culture. It give an interesting insight into the continuing challenges and issues that still plague French thinking and influence French politics. I recommend this fine short study for anyone interested in the "Traps of Power."